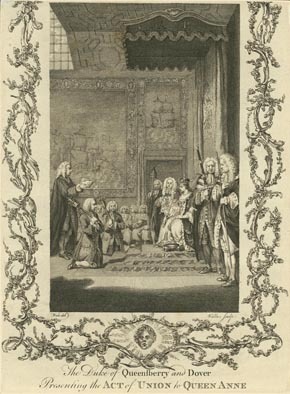 This contemporary engraving shows James Douglas, Duke of Queensberry and Dover (1662-1711) presenting the Act of Union to Queen Anne. By 1700 there was widespread paranoia in England and Scotland over the possibility of a French prince succeeding to the Spanish crown. Meanwhile, Queen Anne, who succeeded William of Orange to the throne in 1702, had no living heir. The threat of Catholic union in Europe and uncertainty over the royal succession forced a reconsideration of the existing links between Scotland and England. Negotiations between the two kingdoms failed in 1702-3, deepening the sense of crisis. In 1703-4 the Scottish parliament declared that in future it would control foreign policy and the choice of Scotland's monarch. At this point English politicians, who had previously been indifferent to the prospect of Anglo-Scottish unity, became convinced of the need for union to protect her northern border, and prevent any Stuart return to the Scottish throne. They used the threat of an economic embargo and invasion to persuade a majority of Scottish parliamentarians to accept a negotiated union in 1706-7.